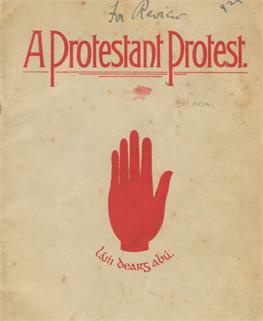 On October 24th 1913 Jack White organised a Protestant Pro-Home Rule rally in Ballymoney. The event was aimed at Irish Protestants who welcomed Home Rule. Several hundred people attended and heard speeches by Sir Roger Casement, Reverend Armour, John Dinsmore and Jack White. At the meeting Captain White read out an 'alternative' covenant declaring their support for home rule. John Dinsmore, a Ballymena mill owner with liberal polictical views, accused local linen manufacturers of encouraging sectarianism amongst their workers to distract them from protesting about poverty wages. The speakers were loudly applauded by the 400 or so people who attended.